Fasthosts Website builder is a nice looking website builder that works well, but is also plagued by annoying lapses in user friendliness. Domain.com provides plenty of features to help you build your website but its plans require a long-term commitment. 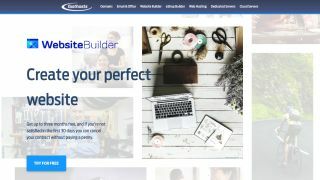 Updated Gator Website Builder allows you to easily create a professional looking site, but its blogging features fall short. Uploading photos, writing blogs, selling your products online, Pixpa can handle it all in a very elegant service that works as intended, and includes very responsive customer support. If you want a simple website that looks good, Site123 may be the service you’re after - as long as your demands aren’t too complex. Dreamhost Remixer offers a simplified layout and some useful customization options that will help you get your website up fast. RIVYT provides a simple way to turn any YouTube channel into a website. Dunked enables creative pros to easily showcase their work, but its limited feature set is too constraining for experienced users. BoldGrid is an easy choice for those familiar with WordPress, but novice users should consider looking elsewhere. DreamHost is okay for simple personal websites, but professionals will find it underpowered.